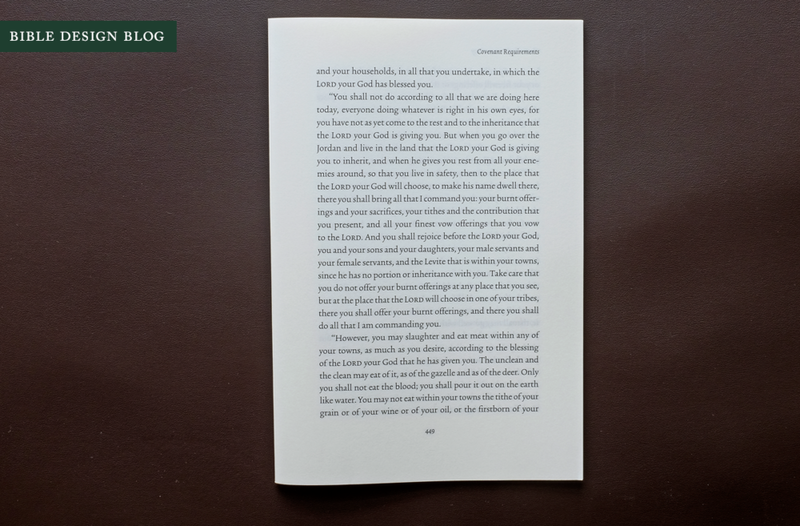 This is Part 2 of Bible Design Blog’s look at the ESV Reader’s Bible, Six-Volume Set. This part focuses on typography and page layout for an index of the complete series, scroll to the bottom of the post. Most Bibles make sacrifices on the page for the sake of the book. They set fine print text in two columns, packing cross references into a third, jamming as much information as possible onto each and every page. This makes each page a little (or a lot) less readable, but results in a handy book that’s easy to carry around. I first wrote about this tug-of-war between the page and book back in 2008, and everything I wrote then remains true ... except in this case. The ESV Reader’s Bible, Six-Volume Set doesn’t make sacrifices on the page. Because it divides Scripture into six volumes instead of one, the set doesn’t have to make sacrifices to the book, either. Publishing the set in six volumes cuts the Gordian knot of Bible design, freeing the page to be as readable as possible without condemning the book to unusable proportions. Along with review copies, the publisher provided me with unbound examples of the 48-page signatures. (If this is a new term, check out my post explaining how books are made: "Inside a Book Block.") I'm going to use these signatures in the photos rather than a bound book because they're easier to photograph flat and you get a slightly better sense of the page proportions. Another advantage to having unbound signatures is that I can devote a future post to the paper itself (including some somewhat ... destructive testing) without damaging a finished book. Let's look at the proportions of a single page. 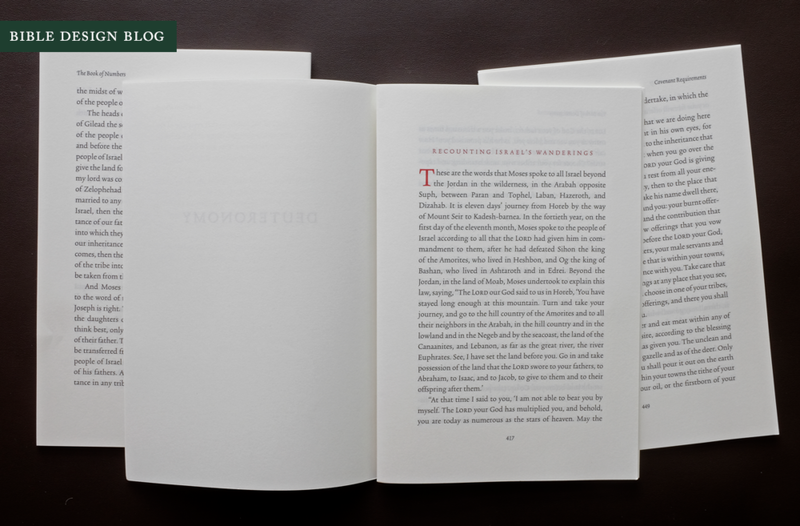 The unbound page measures 7.75 inches tall and 5.5 inches wide. The outer margin is 0.5 inches, while the inner margin allows around an eighth of an inch more to accommodate the binding. The text column is a shade under 3.75 inches wide, and about 5.75 inches tall. The upper margin is roughly 0.75 inches from the top of the sheet to the top of the text column, while the bottom margin affords a bit more room, approximately 1.125 inches. Apart from the headers and page numbers, the text flows uninterrupted page after page with the exception of occasional section break. Here, the titles are printed in red ink, as are the drop cap letters that begin the sections. The title in the photo above -- "Covenant Requirements" -- illustrates the technique. The section titles are attractively set and relatively unobtrusive. How frequent are these breaks? In the three unbound signatures I have, running from p. 377 through p. 484 in the first volume, Pentateuch, there are no breaks at all in the first signature (pp. 377-412), two in the second (pp. 413-448) — though, in fairness, one of them is the start of Deuteronomy, so it’s introducing rather than breaking into the reading — and one in the third (pp. 449-484). The rationale for the breaks is to give the reader a broad sense of context within the flow of the text. Deciding where to break and title the text was a judgment call. According to Crossway, they inserted these titles wherever it seemed helpful. If you're one of those people who was hoping for no breaks at all in the text, don't get too disappointed. These additions are relatively infrequent, and at least in my experience, they are not distracting. In Part 1 of the series, I alluded to The Gospels, an earlier volume published by Crossway which, like the ESV Reader's Bible, Six-Volume Set, was printed and bound by L.E.G.O. in Italy. Looking back, it's clear that The Gospels served as a harbinger of things to come. That book is set in the same typeface as the Reader's Bible and follows the same layout conventions -- the running headers, the occasional section breaks with titles. If you compare the two, it becomes clear that the typeset is not exactly the same. The spacing is different, the pages break at different points in the text. Although the paper specification appears to be identical from the colophons, it isn't (as I will explain in the post dedicated to paper). Yet in most respects the Reader's Bible represents a refinement of the format launched earlier in The Gospels. The Trinité No. 2 type is set at 12 points, with 15 points of leading. On a full page without any section breaks or spacing to set off poetry, there are 28 lines of text. By comparison, The Gospels, also set in 12 pt. Trinité No. 2, is more generously leaded -- which might explain why, despite the numbers, my eyes refuse to believe that the type is the same size in these two editions. A page in The Gospels holds 26 lines of text, two less than in the Reader's Bible. The typography of the Reader's Bible conveys a sense of timelessness. There are no ruled lines in the header, no sans serif fonts for contrast. Nothing happens on the page that couldn't have happened a generation ago. Nothing happens that couldn't have happened in the era of lead type. Some designers might see the choice of classic proportions and type as rigid and formal. Most readers, however, won't see them at all. 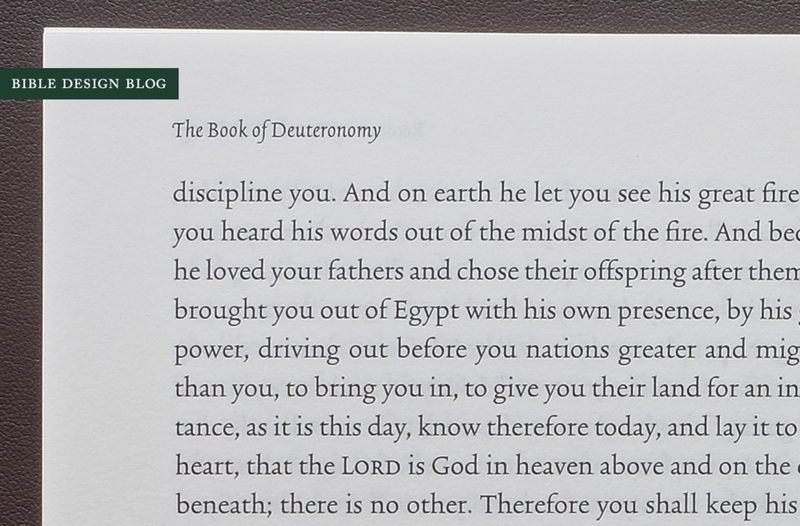 Unlike a lot of modern Bible typography, this approach doesn't scream that it's a product of the twenty-first century. The Reader's Bible might have been published fifty years ago looking like it does, or for that matter fifty years from now. To me, that is a good goal to shoot for in a publishing project of this nature. The Bible like this does not, of course, capture what it must have been like when the church at Ephesus unspooled their letter fresh from the Apostle Paul. Nobody had printed Bibles back then, any more than they read English. Whatever it was like that day, we can never recapture the moment. That isn't the goal of a reader-friendly Bible, anyway. The point of a Bible like this one is to provide a less mediated experience that supports longer, deeper reads. In old fashioned design parlance, the formatting just gets out of the way of the reading material. I'm a voracious reader of all kinds of books, good and bad. Thanks to my knowledge of design and typography, I can't put up with as many sins in those areas as an uninitiated reader might. Still, I relied for years on Bibles whose design and typography was, frankly, bad. While I do not miss those days, it's not as if I stared uncomprehendingly at the pages of those old fashioned reference Bibles, unable to glean any meaning because of the small type and intrusive apparatus. When I say that the Reader's Bible is much more, well, readable, I only mean that compared to all those bad examples, this one puts much, much less in the way. As a result, my reading flows more easily. I comprehend more. I make intertextual connections I might otherwise have missed. The sad thing, from a typographical standpoint, is that the best work goes unnoticed by design. A lot of effort went into the layout and typography of the ESV Reader's Bible, Six-Volume Set, only it doesn't look like it. In the best possible way. You will spend hours reading from one of its volumes, and afterward you will remember what you read, not what you saw on the page.